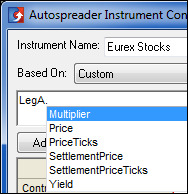 Multiplier: Same function as the per-leg Spread Multiplier setting in the Autospreader Configuration Dialog Box; it weights the value of the leg to calculate the spread price. The formula references the Multiplier value that is set for each leg. For example, if the spread formula includes ‘LegA.Multiplier’, then the Multiplier value set for Leg A is used as part of the formula. Price: The best inside Bid and Offer for that Leg. PriceTicks: The price format of the contact in ticks. SettlementPrice: The previous day's settlement price. SettlementPriceTicks: The previous day's settlement price in ticks. Yield: The price as a percentage representing the annual rate of return. When selected, a new set of per-leg properties appears in the Configuration Dialog Box.